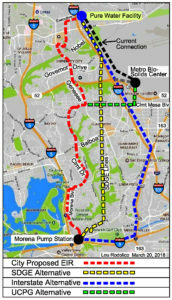 Map shown above are of the Pure Water proposed alignment and alternative routes proposed by UCPG. The red Pure Water proposal will have a valve and water hammer condition at the top of every hill, including Governor and Genesee. In order to purge air in the sewer lines the valve will periodically and without warning emit a potentially noxious, toxic sewer stench at the intersection. Water hammer, which is a loud banging sound will also occur at every hill, some may assume that an earthquake is in progress. There are several of these hills with the red Pure Water proposal. The yellow SDGE alternate has very few hill conditions because it is a straight, deep, underground run. The yellow solution is the only one that encloses the sewage pipes within a larger pipe and has a built-in safety feature that contain sewage spills. Many consider yellow both the conservation and environmental choice. The city has big plans for a water reclamation program known as Pure Water. The final Environmental Impact Report (EIR) was recently released and City Council will be voting whether to approve the project on April 10th, 2018 Phase one of this water reclamation project could produce 30 million gallons a day of potable water. It is hoped that when the entire project is complete, it would provide up to one third of San Diego’s drinking water by 2035. Phase one of the project is scheduled to be complete in 2021 and cost $1.2 billion. The entire project is expected to cost $3 billion, of which $2.3 billion would be provided by the EPA in low interest loans to the city of San Diego. This project serves two purposes: reducing dependency on imported water; and reducing the amount of solid waste being process at the Point Loma Sewage treatment facility. The Pure Water project consists of pump stations, pipelines, solid waste recovery, and the water reclamation facility. The water reclamation processing will take place at a facility just east of 805, between Miramar and Eastgate Mall. The Morena Pump station will be located just northeast of the I-8/I-5 interchange. The Morena pipelines will run between the Morena Pump station and the Pure Water plant (NCWRP); to be built under Morena Boulevard, Clairemont Drive, Genesee Avenue, Nobel Drive and Town Center Drive. This pipeline would have a large pipe (48” diameter) to transport the raw sewage upstream to the NCWRP, and a smaller pipe (30” diameter) to transport the brine/centrate back to the Morena Pipeline. The pipeline is to be placed along existing right of way of city streets – it will cross several canyons and mesas – requiring pumps to move the sewage up and down the hills between the locations. The portion of the forcemains that impacts us here in UC is the part that runs north from Clairemont along Genesee, then east on Nobel, and north on Town Center Drive. Most of the pipeline will be placed by trenching the roadways deep enough to place the 48” pipe and the 30” pipe 5-8’ below the surface, and below existing utilities. The trench is expected to be 12-16 feet wide and will require lane closures during construction. Additionally there will be tunnels bored to run the pipeline under San Clemente creek at the Genesee and 52 intersection, and under Rose Creek and the railroad tracks near Centurion Square, and another tunnel under I-805 from the end of Executive. Of specific concern are the intersections of Genesee and Governor and the corner of Nobel and Genesee. Genesee and Governor is a critical intersection for South UC. Governor is the only East West connector for emergency vehicles. There is also a high risk to encounter contaminated soil from leaking underground gas storage tanks. Three of the four gas stations at the intersection have active status for leaking underground storage tanks. If the trenching encounters contaminated soil, additional steps must be taken to handle this soil. The risk of contaminated dust being generated increases. This intersection is adjacent to Curie Elementary School, Regency Villas Senior community, All Saints Preschool, and Standley Middle School. Seniors and children could be at risk if contaminated soil is encountered. EPA processes would be triggered. At Nobel and Genesee there are two residential communities on the south side of Nobel that have already had major impacts of construction from the trolley construction and Westfield renovation. The Westfield residential tower is currently under construction, impacting traffic, creating dust and making noise. It will not be completed till late 2019 to early 2020. If it is approved the proposed Costa Verde expansion is also slated to start construction in 2019. The cumulative impact on the residents from all of this construction was minimized and misrepresented in the final EIR. The construction along Genesee will be done at night between 9pm and 5am. It will be between 8:30 and 3:30 on Towne Center between Nobel and La Jolla Village, and between 7:30 and 4:30 on Nobel. Once the pipeline is under operation there is a risk of rupture or leak of the pressurized sewage. There is also the risk of noise due to ‘water hammering’ as the pressure changes when it goes up and down the canyons. And there is a risk of odor at the relief valves. One of the valves will be just north of Governor Drive. The local planning group, UCPG, formed a subcommittee to review the draft EIR and submit a response. 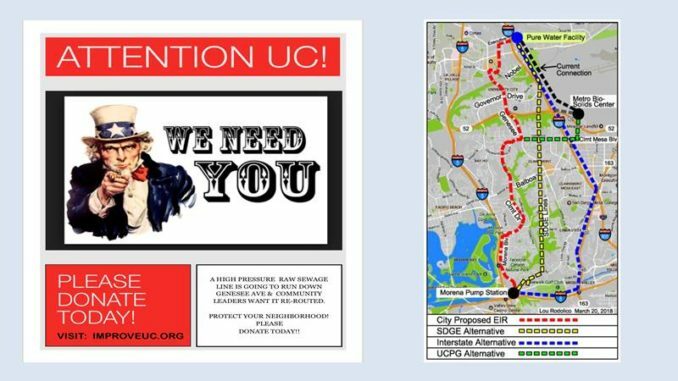 The UCPG submitted a letter produced by the subcommittee expressing their concerns about construction impacts and whether it was appropriate to run this pipeline through a residential neighborhood and expressed concern of risk of sewage spill if the pipeline breaks or leaks. The city dismissed these concerns. The draft and final EIRs did not present alternative pipeline alignments and the Morena pipeline alignment was not presented to the public till the draft EIR stage. UCPG proposed several alternative pipeline alignments, including one that the city had studied prior to the draft EIR, which would run under the SDG&E high power lines. Please see graphic. The city rejected all alternatives in their final EIR. Notice of Public Hearing: On April 10, the San Diego City Council is scheduled to hear the case for approving the City’s Pure Water Project at 2:00 pm (Council Chambers, 12th Floor, 202 “C” Street). 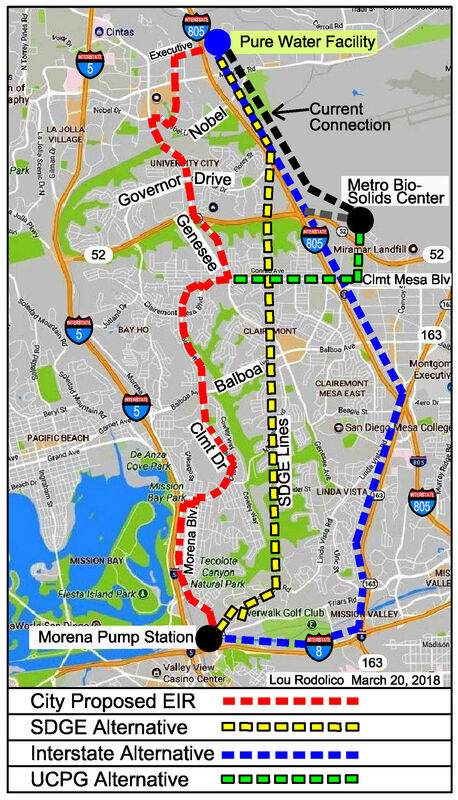 UCCA, UCPG, and UCCF have all voiced opposition, not to the project itself, but to the sewer pipe alignment along Morena Drive, Clairemont Drive, Genesee Avenue, Nobel and Town Center Drive. Those unable to attend the hearing may express support or opposition to this issue before the date of the hearing and decision by City Council. All communications will be forwarded to the Mayor and Council members. To ensure that Council Members receive your comment before they vote on April 10, email or fax by end of day April 9. Editor’s note: Submitted by Katie Nelson Rodolico, Member of the UCPG Pure Water EIR Subcommittee.